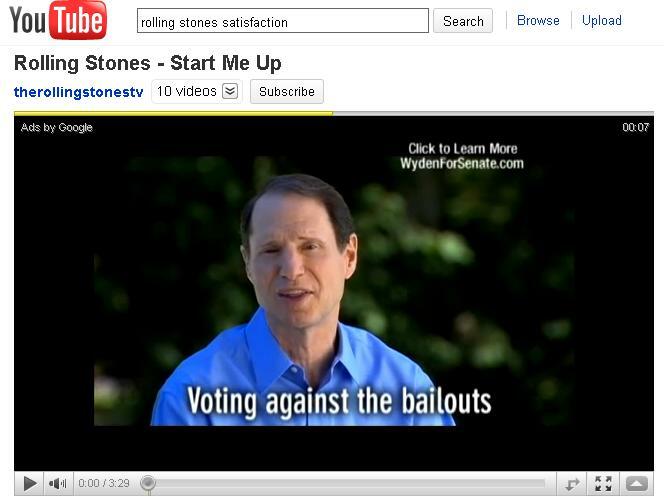 New political ad device: Wyden interupts my music video! While trying to watch a Rolling Stone You Tube video I was greeted not by the famous Mick Jagger but by my local Oregon politician Senator Ron Wyden (If I were on drugs this would have been an ugly culture shock). His words began “Your video will begin in 10 minutes but first let me tell you….”. On some videos the song actually begins playing as Wyden is happily talking away. Fan or no fan of Wyden, this is the future of advertising on two fronts. First, it shows how prevalent local target advertising has become online. Second, it represents the ever encroaching ad market online which is seeping into videos and other new territory. More and more the internet is becoming a clutter full of ads and it will get worse as online media vehicles need more revenue to pay for their costs. This is why you see more full-page ad splashes on major television and newspaper websites. Online brings traffic, just not enough revenue. Expect more politicians to appear on your screen near you.